028-dc-corporate-photography-magazine-photographer-EOS Magazine Apr-Jun 08 - The Third Way-irene-abdou-photography.jpg | Irene Abdou Photography, LLC - Travel. Lifestyle. Documentary. NGOs, Development & Public Health. 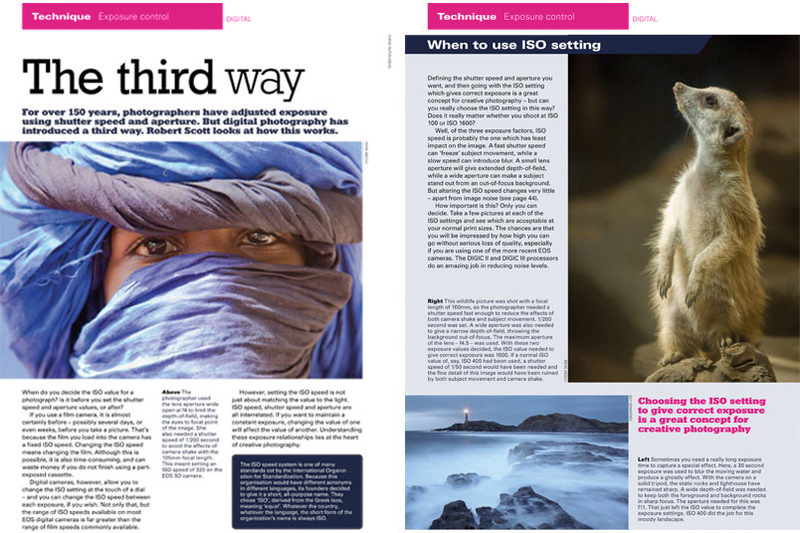 These photos were used to illustrate an article in the April-June 2008 issue of EOS Magazine about how ISO, in conjunction with aperture and shutter speed, is used to adjust exposure. Left: "Wrapped in Blue," 1/2 page photograph. Caption: "The photographer used the lens aperture wide open at f4 to limit the depth-of-field, making the eyes the focal point of the image. She also needed a shutter speed of 1/200 second to avoid the effects of camera shake with the 105mm focal length. This meant setting an ISO speed of 320 on the EOS 5D camera." Right: Mongoose, 1/2 page photograph. Caption: "This wildlife picture was shot with a focal length of 160mm, so the photographer needed a shutter speed fast enough to reduce the effects of both camera shake and subject movement. 1/200 second was set. A wide aperture was also needed to give a narrow depth-of-field, throwing the background out-of-focus. The maximum aperture of the lens f4.5 was used. With these two exposure values decided, the ISO value needed to give correct exposure was 1600. If a normal ISO value of, say, ISO 400 had been used, a shutter speed of 1/50 second would have been needed and the fine detail of this image would have been ruined by both subject movement and camera shake." About EOS Magazine: EOS Magazine is a British-based quarterly subscription magazine for Canon EOS camera users, addressing 35mm film, Advanced Photo System, and digital photography. The 80-page full-color magazine is mailed to over 100 countries each quarter.